Kids. They grow up just so darn fast, don’t they? Or in the case of the Darkness, all it takes is a little soul snack to go from baby to little girl. How many souls does it take it to go full adult? And can the Darkness ever be satiated? And can you believe Crowley is willing to help it? So many questions stemmed from Supernatural Season 11 Episode 2, not only involving the Darkness but Death, Castiel and even where the show plans to go from here. 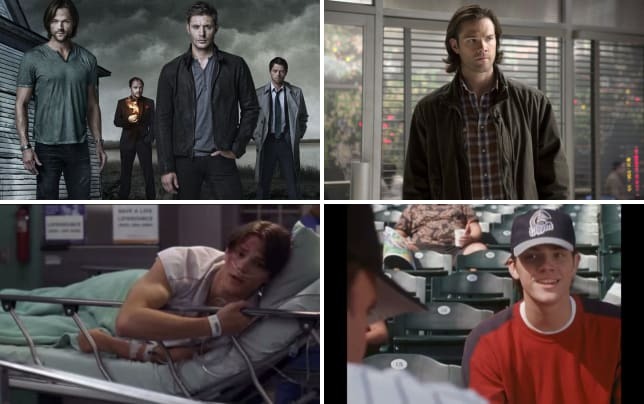 Supernatural Photos from "Form and Void"
The clear front-runner for big bad is the Darkness. Yes, Metatron and Rowena are still out there, and Crowley is getting back to his bad self, but the Darkness has the potential to really make a stamp on the show. I initially liked the idea of having it inhabit a newborn’s body, but the whole “Feed me” wooden block bit or the closeups of a baby cooing meant to be creepy wound up feeling silly. Can you imagine if the Darkness was a baby that never talked and only cried the entire season? I’m sure we’d probably all get a little tired of that before long. So seeing it growing and shifting its appearance, with the revelation that it feasts on souls was a relief. But I’m hoping that the Darkness’ presence as the little girl doesn’t seem like just another Lilith. And I can't help but think of how the Leviathan or Eve turned out. It's still early, and there is a certain creep factor, so I'm remaining positive with respect to the Darkness as a solid villain. But what’s up with the Darkness and Dean’s bond? Is it like an imprinting thing? He’s not really in love with the Darkness, is he? I’m hoping their whole connection, and what that means, finds some payoff in the future because right now, it just seems rather weird. That said, Crowley made it pretty clear he’s not a sidekick. I’m glad he made that statement, and hope he keeps his word. After Supernatural Season 10, I’m looking forward to seeing Crowley get something far more interesting to do. The same could be said for Castiel who, aside from getting a cool fight sequence, was simply tortured by angels during the hour. We only really learned that Rowena’s spell on him was super powerful, and not even Hannah (RIP) could heal him. I was hoping for a little more from his story, but perhaps we won’t get to see that new journey until after he gets himself back to normal. If only he could do it as fast as Sam because, wow, the younger Winchester figured out the cure to his infection mighty quick. Or that’s what it seemed like. I still wish he had told Dean about it considering his speech in Supernatural Season 11 Episode 1, but he did prove self-sufficient enough to figure out that holy water on fire does the trick. He also seemed ready to give himself up, and he talked of letting Dean have a life. Does that remind anyone of what Sam did back in Supernatural Season 5 Episode 22? But what the heck did that vision mean? Was that when he was trapped in the cage? Is that something else completely? What’s more, I’m confused about people dying on Supernatural now. We did see a reaper and she talked about Sam and Dean not really getting any more chances to die and come back. So Death’s death doesn’t prevent people from dying? Did I miss something? If anything, I'm just glad that Sam and Dean reunited by the end. Sure, there are plenty of questions I'd love to have answered, hopefully in due time, and I'm a bit hesitant when it comes to the new big bad. But the overall direction of Supernatural Season 11 is intriguing, and I'm still looking forward to seeing the Winchester brothers tackle whatever obstacle they have to face. What did you think of Sam's vision? What's Crowley's plan with the Darkness? Sound off below, and watch Supernatural online so you don't miss out on any of Sam and Dean's hunts! 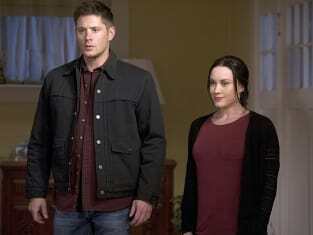 Note: Supernatural Season 11 Episode 3, "The Bad Seed," airs Oct. 21 at 9 p.m.
Sean McKenna was a TV Fanatic Staff Writer. He retired in May of 2017. Follow him on Twitter. I'm not your bloody sidekick! Permalink: I'm not your bloody sidekick! What can I say. Chicks dig me. Permalink: What can I say. Chicks dig me. Supernatural Round Table: Is Death Really Dead? Supernatural Photo Preview: Confessions to Father Crowley?